While it is easy to control cis- vs trans- double bonds in Wittig reactions (think about stabilized vs non-stabilized ylides), it is certainly not the case with amide bonds. In fact, one of the fascinating questions I like to think about together with my students is why we are always tempted to draw trans-amides as products of amide bond forming reactions. Granted, trans isomers are more stable. But who’s to say that they always form under kinetic control? 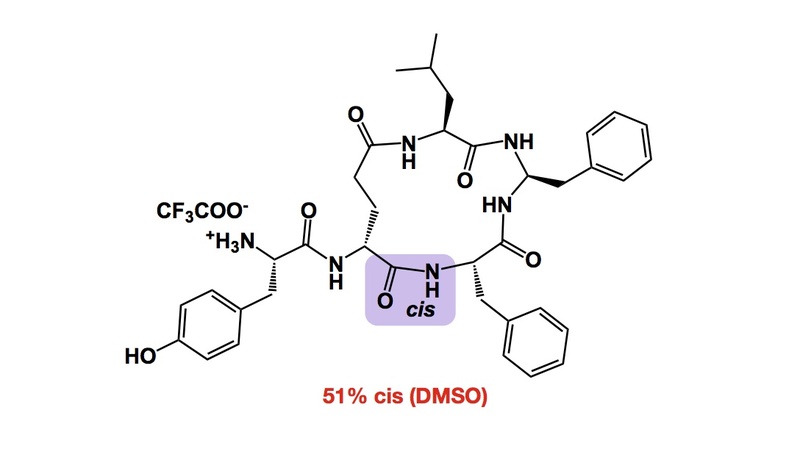 This is a mystery… One might say that this is not one of those “relevant” mysteries as in linear peptides cis amides will certainly (and rapidly) isomerize… But hold on a second: this does not need to happen in cyclic variants. I give you a very informative example from the late Prof. Goodman. This aminal-containing macrocycle contains one amide bond that is largely cis in solution. The reason this is cool is that this case is not based on proline, which tends to give a large proportion of cis-amides for different reasons. We need to think more about deliberate control of cis/trans isomers in these systems.